While [Bremster] likes the view from his office window, he often needs to get up and adjust the blinds several times throughout the day in order to keep the glare from killing his eyes. Like any other enterprising hacker, he decided that constantly adjusting them was too repetitive, and that he could automate the process with electronics. He thought that RC car servos would be a great choice to control the blinds, since they are cheap and the geared drive system offers a lot of torque at low speeds. After modifying the servos to enable continuous rotation, he set off to the hardware store in search of a way to mount them to the blinds’ looped cords. After mounting some nylon spacers with rubber grommets on the servo arms, he installed them into a set of brackets he built and gave the blinds a spin. Now, he can easily control his blinds from the comfort of his desk with the simple flick of a switch – that’s the kind of laziness ingenuity we can respect! 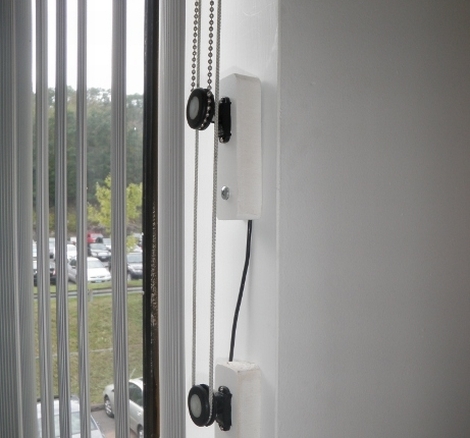 Continue reading to see a quick video of his motorized blinds in action. this is just like one of my abandoned projects: the modified servo, the mechanical connection…except i wanted to use a tiny micro and ir control and mske the whole thing battery powered. great build! simple and efective. Great idea! The addition of a photocell and a microcontroller would make this fully automatic. My blind closer does exactly that. Write-up never got finished, but it uses light and temp paired with a parallax continuous rotation servo. Couple photos here. A timer would probably be sufficient, as the sun moves fairly predictably. Very clever, really like the professional look. Wish I had blinds that used chains so I could do something similar. Mine use a rod. A servo attached to the loop the rod normally goes through with a small keyring worked nicely. I don’t see why this can’t be applied to curtains as well. If you look at how blinds are actualy constructed. And make your own pulley system. Think I would have to insulate the servos sound wise. As much as I like the noise it wouldn’t be something I want to hear after a while. In addition to the light sensor extra. What about one of thoughs wireless weather stations. A moisture sensor and link servos to the window too. At some point, im gonna do this as well as automate my lighting. then im gonna launch the script when xbmc launches so everything comes together on its own when we want to watch a movie. I love the ingenuity And no RC models were sacrificed to make the project happen. Although I am not apposed to recycling of rc parts as others have done with other hacks I’ve read. I always love to read how rc parts are put to use outside of the Radio Control environment. Nice Hack. I did something like this with my old “Construx” building set when I was a kid! One thing I’m curious about, can anyone think of how this could be done with miniblinds? I.e. you have to move the cord way over in order for it to properly lock. How about removing the locking mechanism altogether, and using the servo in a kind of windlass arrangement with a weight to offset the weight of the blinds? Can anyone let me know where to get the parts to build this? I’m extremely novice but would like to give this a try.